Our beautiful and bright classrooms are designed to be stimulating and comfortable for children to learn and explore. They offer a diverse array of Montessori activities that teach tasks ranging from simple to complex. With ample space for personal, small group, and whole class learning experiences, our school provides the collaborative environment that is paramount to the Montessori multi-age classroom. Here, older children build leadership skills as they help their younger friends; and conversely, the junior students observe and learn from their older counterparts while gaining exposure to activities they will soon be doing themselves. The prepared environment and curriculum addresses a full range of social, emotional, physical and cognitive needs of the 3 to 6-year-old child. Montessori materials are carefully designed and sequenced for optimal learning. Our curriculum incorporates Mathematics, Language, Practical Life, Sensorial, and Culture. 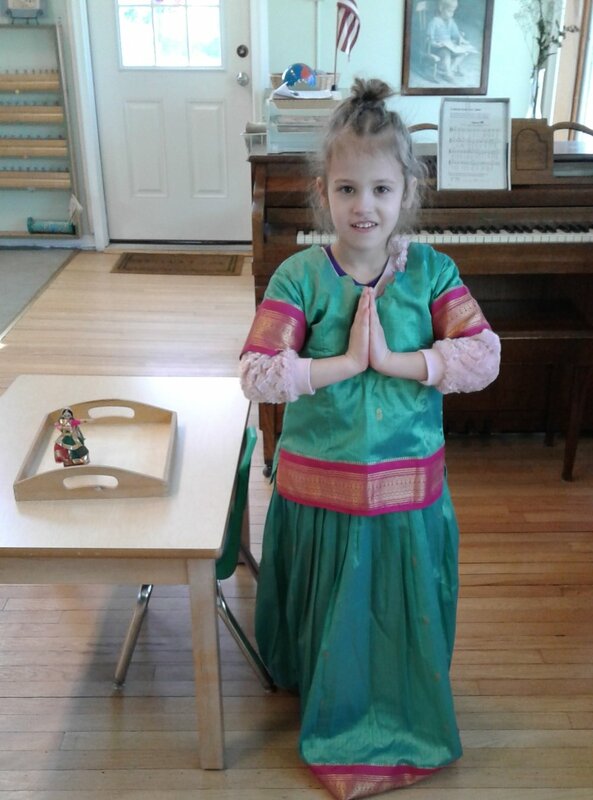 Every aspect of Freehold Montessori classrooms strengthens the child’s independence, confidence, and knowledge, while cultivating respect for oneself, other people, and the world at large. The area of Practical Life includes activities concerned with care of self or others and care of the environment. The child develops independence and self-discipline through the use of the practical life materials. As the child learns how to button and tie, how to pour from a pitcher without spilling and how to care for the plants in the environment, he or she grows in confidence and learns to take pride in his or her abilities and work. Practical life includes everyday activities. The child learns to prepare and to serve snack and lunch, to sew, plant in the garden and clean the environment. In addition to learning a particular skill, the child learns to follow a sequence of steps and develops a sense of order. Many of the Practical Life works develop fine motor skills that prepare the child for future academic work. This second area of the classroom is unique to Montessori. From the moment they are born, children use all of their senses to learn about their environment. As students sort, grade and build with the sensorial materials, they learn to differentiate between objects and refine the senses. The child also becomes aware of subtle differences and learns to appreciate his or her surroundings. Many of the sensorial materials prepare the child for mathematical concepts as they learn about differences in length, weight and shape. The Montessori environment is rich in language. Expressive language is the entry point for all reading and writing activities. In the Montessori classroom children are involved in conversation with the teacher and with each other. What the child has to say is valued. Children are encouraged to "write" using the moveable alphabet before they are able to write using a pencil. A love of reading and early exposure is a hallmark of Montessori education. Phonics is introduced using the sandpaper letters. The tactile sandpaper letters are just one example of Montessori’s multi-sensory materials that utilize the different senses to acquire information. Children learn the sound of each letter, while using their sense of touch to feel the textured letter. As the child learns the individual sounds of the letters, he or she begins to read quite naturally by putting the sounds together into words. Since the Montessori Primary classroom spans a three-year age range, the younger children have many opportunities to witness the older children writing and reading. It becomes a natural next step, which they are eager to take. 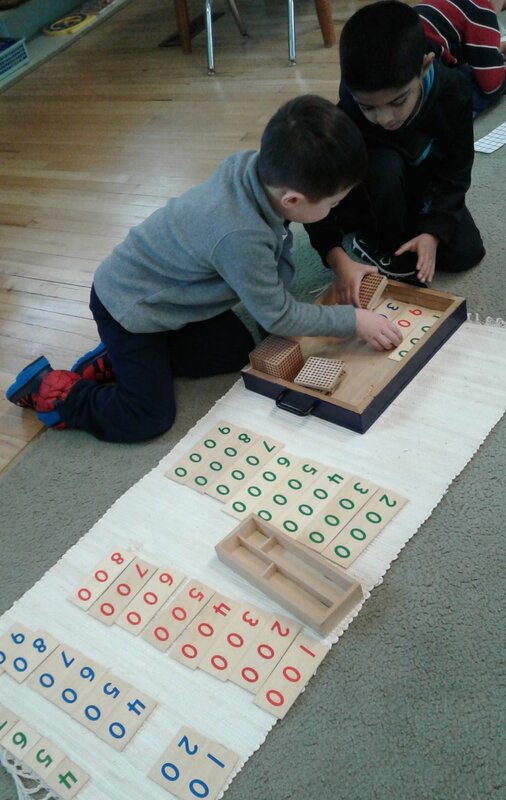 When ready, students explore math concepts through the use of beautifully designed and sequenced Montessori materials. Through the use of concrete materials, students develop a sense of numeracy, learn to count and make connections between number symbols and quantity. Students continue developing basic concepts including skip counting, computation, place value and fractions with these hands-on experiences. Sensorial materials help develop early concepts in geometry and algebra.